I think the cook at a local eatery gave me an e coli burger because he didn’t like my hat. That’s the theory I’ve been operating under the last 48 hours. 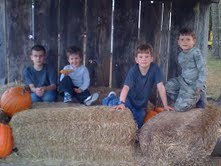 We went to the pumpkin patch as planned yesterday regardless, and it was lovely. I was miserable, but it was lovely. It’s good to be able to recognize the latter in spite of the former, don’t you think? It’s something I’ve been working on. Wife and I sat in the autumn sun and watched the boys trudge with round sleds to the top of a mulch-covered hill that has two plastic pipes running through it which serve as slides. We listened to their squeals echoing through the pipes, and the rumble and shush of their sleds racing to the bottom ends of the pipes, from which they flew, hair blown back, cheeks aflame. Isaac managed to topple a complete 360 degrees, end over end. He will be a tough guy if he lives to adulthood. They climbed to the top of a barn, and rolled about in a corn bin. They climbed over and under hay bales, and bounced on a big device that I don’t understand, but which looked fun. It looked like so much fun, in fact, that I went against my better judgment and heeded their beckoning pleas that I join them. I don’t know if I have e coli or something more pedestrian, but I can attest that whatever it is, it doesn’t like for its host to jump up and down. They should put that on WebMD. It also doesn’t like for you to get on a four-wheel pedal car and race your children around a bumpy, hilly track, but three year-old Isaiah was looking at me expectantly from the back of a two-seater, so in a fit of sunshine-fueled inspiration I gave it a whirl. And I won, but at great price. That’s all I’ve got to say about that. There was also a tractor-pulled wagon ride, and of course the corn maze (“Boys, slow down for dad…”), and swings and see-saws and the inimitable pumpkin cannon, which we watched launch its payload a good quarter mile. There was warm cider as well, which one of the proprietors heated up for us special in a big jar and poured into cups. The boys helped an old gentleman who appeared to be on a serious pumpkin-shopping adventure load a whole mess of them into a wagon, after which he pressed a coin into each of their palms. I was impressed at his generosity; only later did I realize he’d given them all video game tokens. I’m not sure what I think about that. And as the sun turned golden the way it does when it approaches the horizon, we loaded up and headed home, stopping to put flowers on Caroline’s grave. It was a good day, a peaceful day. And we should never take those for granted, should we? No, we shouldn’t. Not ever. Shame on the old gentleman who gave your boys those tokens. That’s what I think about that. Sorry about the e coli. It makes you never want to eat out, doesn’t it? Blessings for more good and peaceful days to come. I think video games are great fun, and will happily accept tokens from anyone who is looking to get rid of them. Sounds like a very nice day; the stuff fond memories are made of.